Last week I reminded you that I do not typically decorate seasonally. If you missed it, you can read about that here. But, holidays? Now that is an entirely different story! My husband thinks March Madness is the official launch of spring, but I have a differing opinion in that regard. Easter weekend is the date on the calendar that signifies that winter is officially in the rear view mirror. Finally! There is something special about Easter flowers. 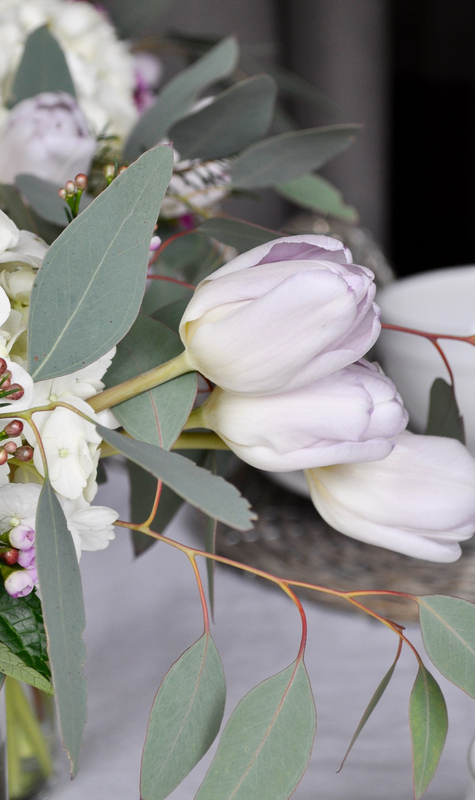 Whether you have an affection for lilies, the unofficial official flower of Easter, or you are more drawn to daffodils, tulips, hyacinth, lilac, orchids or the classic rose, the floral choices are abundant this time of year. It is truly a decorator’s dream time of year! They make lovely gifts and after they are displayed on your dining table, they can be “recycled” in various rooms around the home. 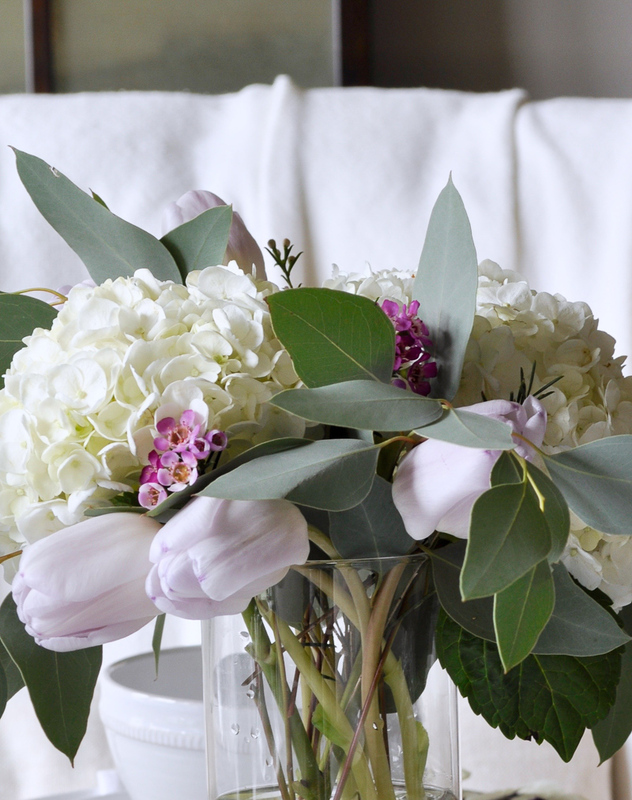 You’ll notice that I always have flowers in several rooms. Many are fresh from our garden, while others are a complete bargain from the local Trader Joe’s. 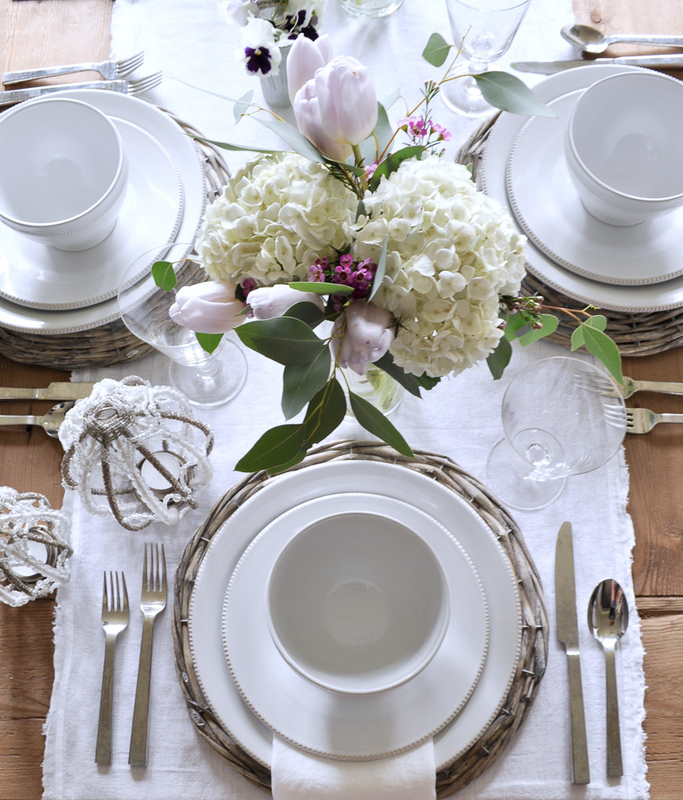 Setting the perfect Easter table should be a fun experience. Be sure and branch out with some flowers you may not have chosen in the past. 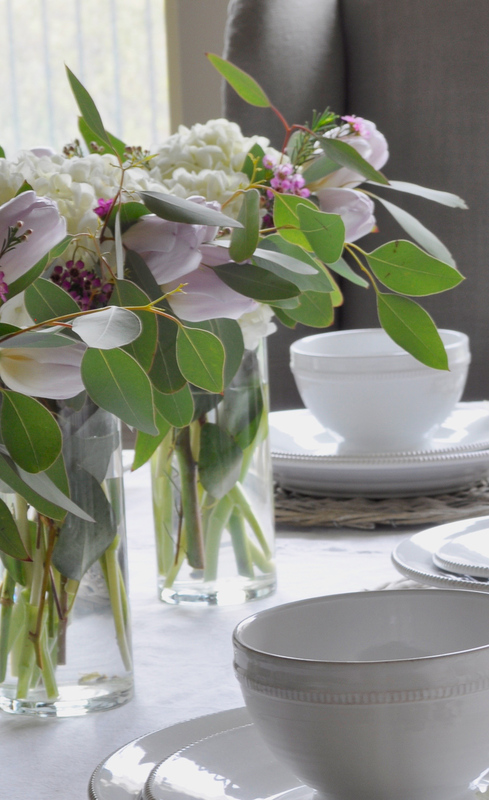 The pops of color (including soft colors) many provide, makes them the focal point of the table and that is how it should be. 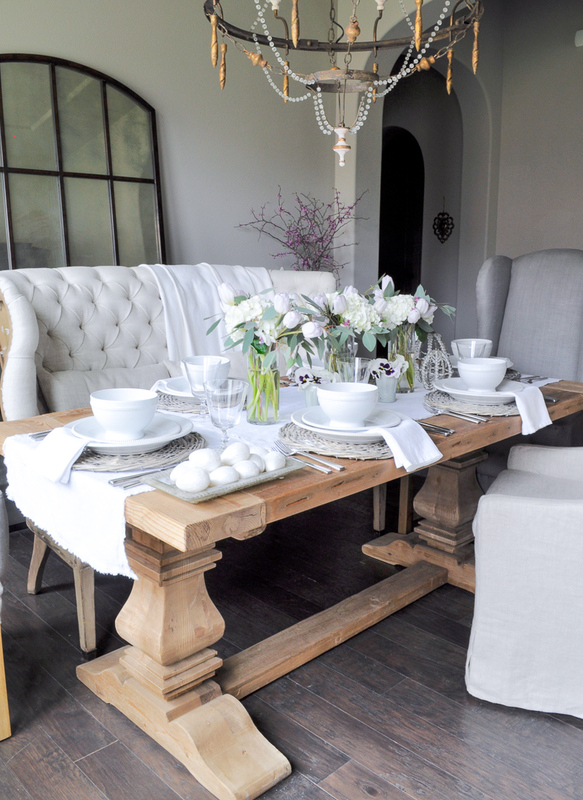 With that being said, please enjoy the tour of my Easter table and be sure and tell a friend about Decor Gold Designs! 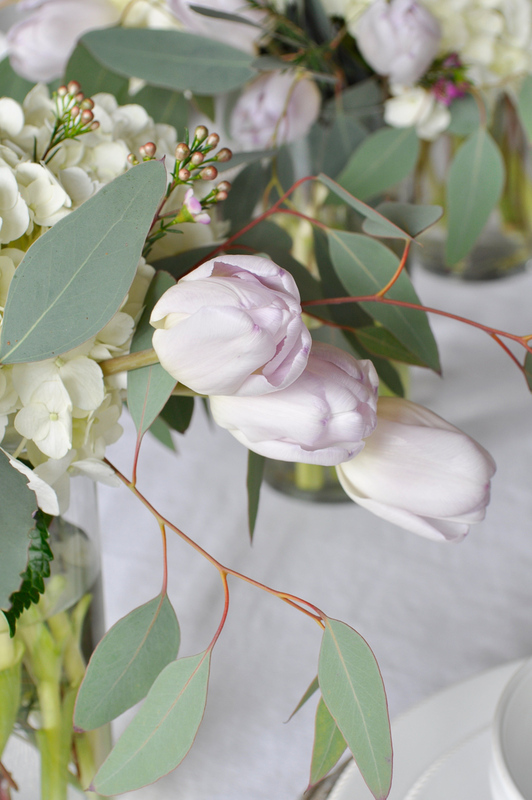 For the centerpiece I chose lavender tulips, white hydrangea, eucalyptus and a few wax flowers in glass vases. 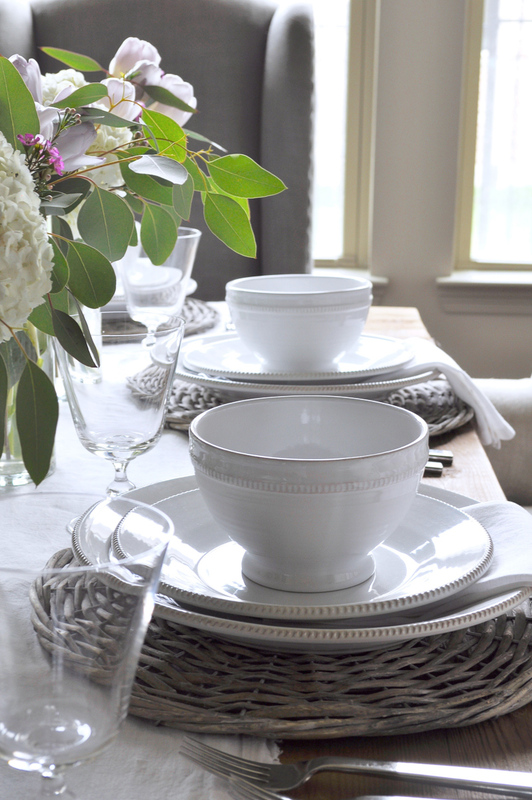 The soft colors set the stage for an elegant table. 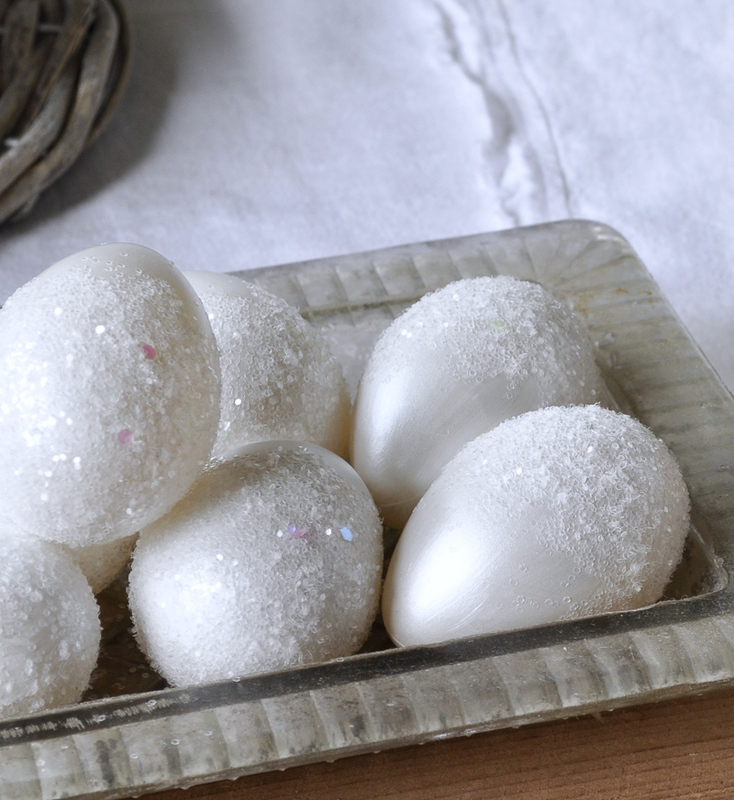 I used pearl craft paint , clear glitter , and iridescent glitter to decorate the eggs. 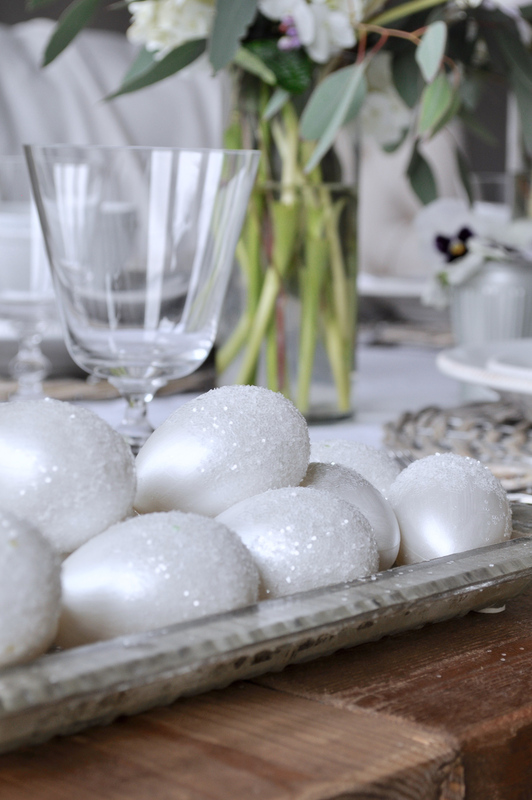 Glittered eggs provide balance on the other end of the table. 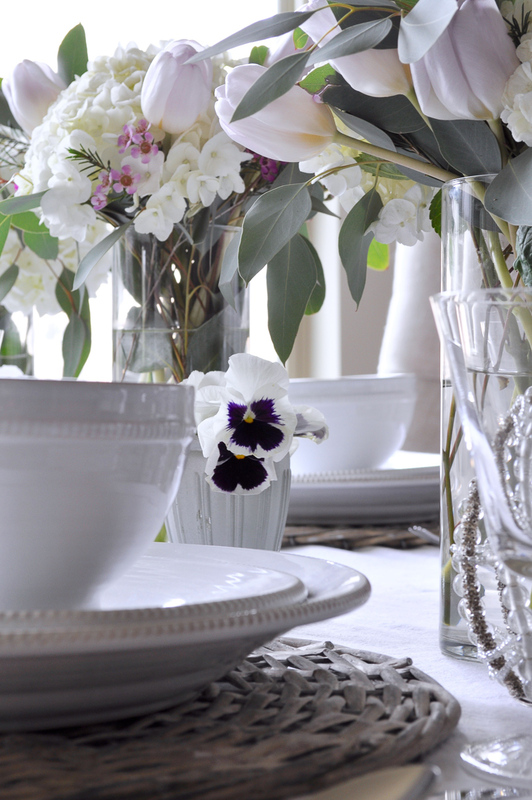 I snipped pansies from my yard to bring an addition spring touch to the table. 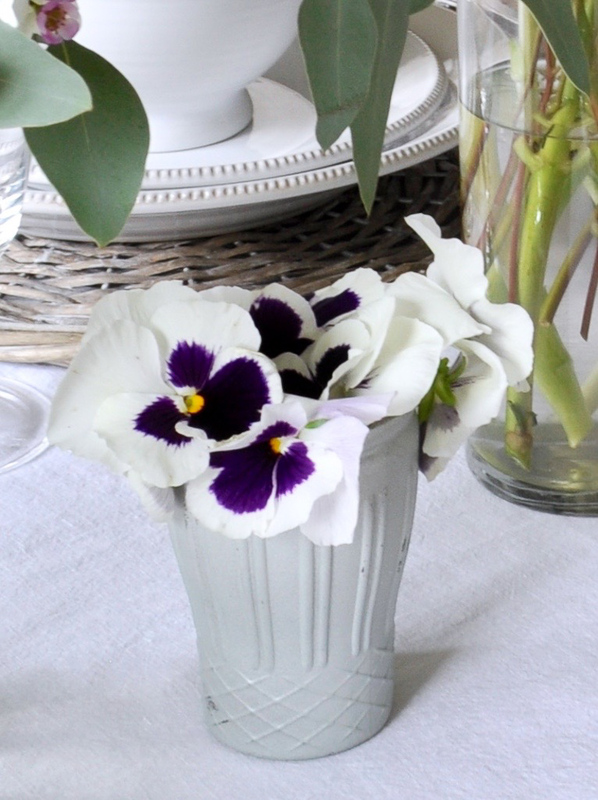 The three taller arrangements act like a canopy for the simple pansy cups. From above, my favorite view. You can shop the look here. I hope you enjoyed the tour. For furnishings and lighting, please visit my Sources page. You can find similar or exact items from my Easter table below. Jen, so beautiful! I love those eggs; although, the sweet little pansy cups may be my favorite! Thank you so much Kelley! I love the little pansy cups too. I clipped them from some pots on my back patio and surprisingly, the are still going strong a week later! Thanks for visiting! I hope you have a wonderful day! 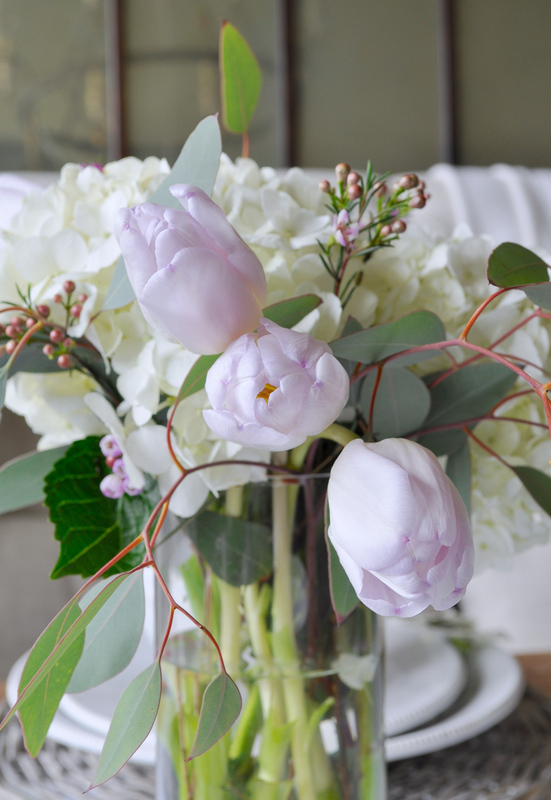 The pastel tulips with white hydrangeas are beautiful and who doesn’t love anything with glitter! The Easter bunny will not hop by your table! The chandelier is absolutely gorgeous!! Thank you so much Jill! You are so right, anything with glitter is easy to love! So Beautiful! Where did the chairs and bench come from? The chandelier? Gorgeous!!! You are so welcome at my house Bree! You are the sweetest and I’m always so flattered by your words!!! This is breathtaking Jen! Love every detail! Your pictures look amazing! Thank you so much Randi!!! You are so sweet to say that…I’m enjoying photography more and more, but I know I have a lot to learn! Jen, this is stunning! 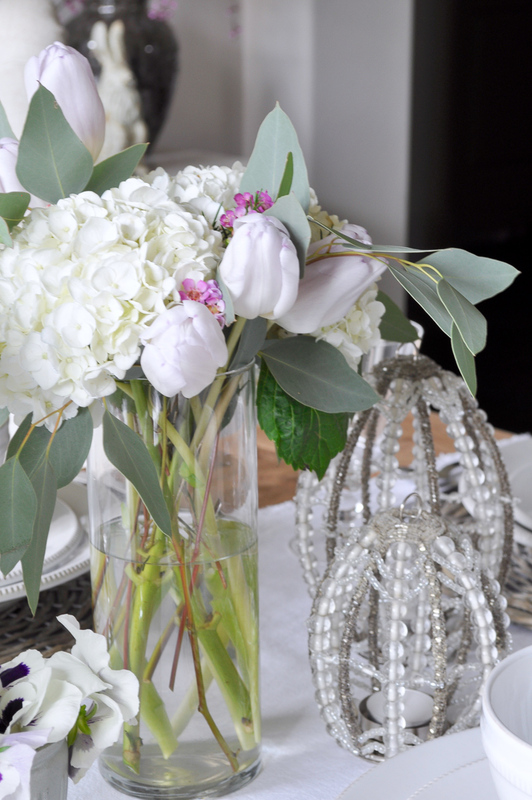 I love the combination of flowers you chose for your table! Thanks so much Kris and thank you for visiting! Happy Easter!!! Your table setting is so beautiful, your pictures are amazing. Thank you for visiting my website and for your kind words Samantha! Hi! 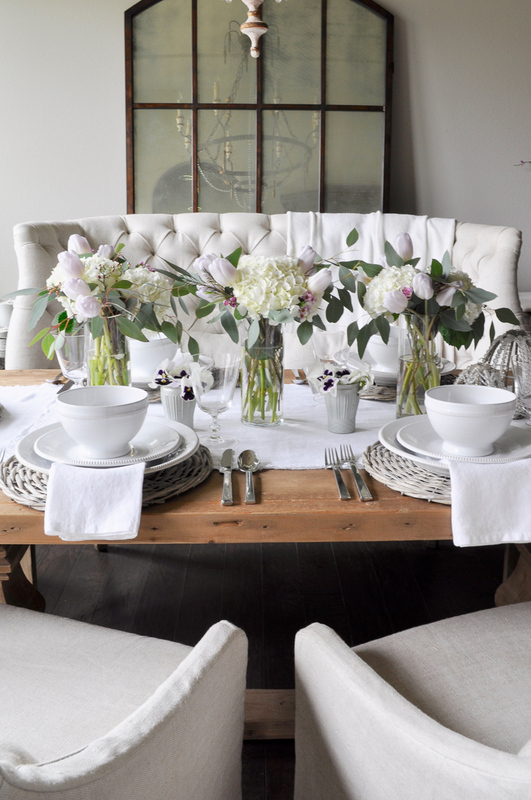 It’s my first time on your blog and I’m in love, it’s so pretty and full of inspiration! 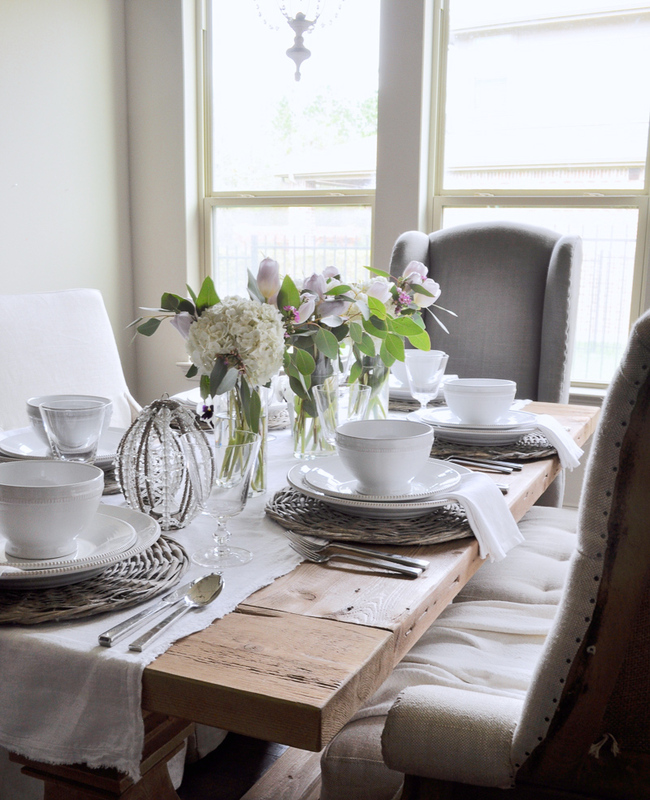 And I love your tablescape too, very chic! You’re very talented! Thank you so much Claire! You just made my day!!! I’m so glad you like the blog! I love the eggs. Did you make those? If so, can you please send me the directions so I can make my own.